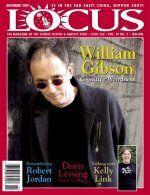 Locus Magazine, covering the science fiction and fantasy field since 1968, is a monthly 8 1/2 x 11'' magazine often with a bright red border. Locus publishes news of the Science Fiction publishing field with extensive reviews and listings of new science fiction books and magazines. The magazine is published from Oakland, California. The founding publisher and editor-in-chief, Charles N. Brown, died in 2009. The current editor-in-chief is Liza Groen Trombi. Reviews of new and forthcoming books, usually 20-25 per issue, by notable SF critics including Gary K. Wolfe, Faren Miller, Paul Witcover, Adrienne Martini, Russell Letson, Karen Haber, Stefan Dziemianowicz, and Carolyn Cushman, plus short fiction reviews by Gardner Dozois and Rich Horton.